In any event, let the lyrics speak for themselves, even though some are difficult to translate well into English. Verse 1 – Bé thơ ơi! Bé thơ ơi! Nín đi đừng khóc. Chiến tranh nào mà không tan nát. Little child, oh little child, please stop crying! What warfare is not ruinous? Khói lên cao trắng tay mau dân nghèo lơ láo. Looking at the funeral head bands on their young. dưới chân tường nhà ai đang cháy. Whose corpse is it, dead since yesterday yet still in sight? By the wall of a house still on fire. Fire is destroying eight city roads. Súng nào giết trẻ đêm đen? Súng nào banh xác mẹ hiền? Một lần đêm vài tan biến mộ dày thêm. Whose guns have killed kids in the night? Whose guns have destroyed their mothers? Overnight, the graves have grown thicker and more. Otherwise we do not speak of it. Mộ chẳng sinh, cỏ chẳng xanh. Người nghìn sau nhắc chuyện đường thành! Whose graves are too fresh for grass to grow. Let future generations speak of these city roads! This recognition appears in some other war songs. For instance, Trịnh Công Sơn’s Gia Tài Của Mẹ – Mother’s Legacy – includes the crucial line in the most repeated verse, Hai mươi năm nội chiến từng ngày: twenty years of daily civil warfare. The Vietnam Conflict was more than a civil war, but this aspect was firmly denied by communists during and after the war. Even to this day, the official line highlights and elevates the anti-foreign characteristics as the war against the Americans with very limited recognition of the intra-Vietnamese dimension. In other words, it has continued to counter what millions of Vietnamese experienced then and later. Eight City Roads was not as popular as many other war songs. But it saw at least two recordings from Republican Saigon by Duy Khánh and, as gleamed from the photo on top, by Thanh Tuyền. The latter’s voice is usually scratchy and does not rank among my favorites. But it is more restrained in this version, and counts among her better recordings. There are several postwar recordings, including a second one by Duy Khánh that is oddly upbeat. 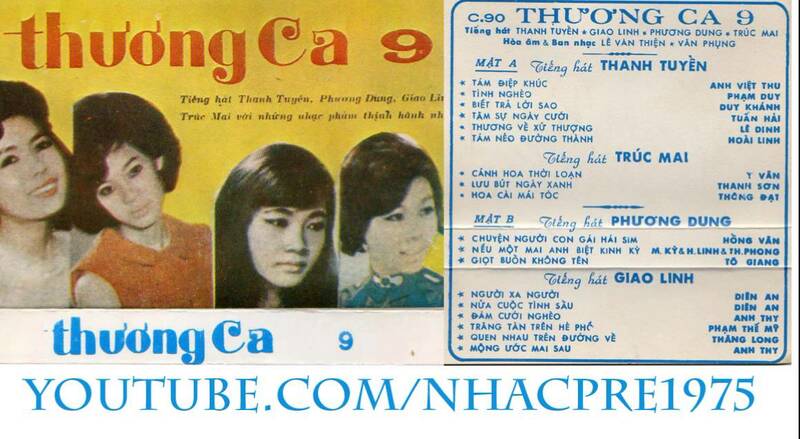 The best one – and by that I mean the all-time best – comes from a little-known singer by the name of Hồng Trúc. It isn’t on YouTube, however, and you will have to listen from another link such as the following. Anyway, why is this song in the ninth spot? After the last post about this series, I realized that a “top ten” list may be too difficult, even impossible. It’s a little easier to create a list of “ten war songs to be in a row.” This list calls for, for among other things, coherence in the sequence. Which in effect means that there could be a number of lists – and this is my list with, hopefully, a coherent sequence. In this case, both Country At War and Eight City Roads are about urban warfare. Hanoi and northern cities had already experienced warfare especially through U.S. bombing, and of course many parts of the countryside in South Vietnam. But war reached Saigon and other southern cities rather shockingly during the Tet Offensive, prompting inspiration for a good number of music, including these songs that I deliberately pair up. It’s a good idea to listen to them back-to-back. Country At War is cooler in composition, arrangement, and Thanh Lan’s performance. Eight City Roads is more sentimental. Be it the Thanh Tuyền or Hồng Trúc recording, arrangement and voice move towards the weepy. It is no accident that Tâm Anh’s song begins with soldiers and works its way towards their sympathy for the dead and children. Hoài Linh’s song, on the other hand, commences with those poor kids right away. It is more elaborate in scenes, juxtaposing for instance a non-buried corpse to a piece of rice. Both songs articulate sorrow and provoke sympathy, but in somewhat different ways. The remaining eight songs will address the sorrow of war too, but also in different ways. The next one, for instance, references urban warfare in setting but is also different from the songs above in important ways. This song is far more representative. It was part of a whole slew of songs written in direct reaction to the Mậu Thân fighting. What I get out of the song is the shock that Saigon people felt at actually having death and war close at hand instead of in the rice paddies or mountains. I think this passage is wonderfully ambiguous. Who is “anh”? It’s some sort of brother, which means it is some Vietnamese person, someone you could be close to, should be able to communicate with, but it’s not clear to me whether it refers to one side or the other or both. Is it the Vietnamese people in general? In this way it is similar to Trịnh Công Sơn’s songs. Being an older brother it also implies someone with agency in the matter. The song is a call for peace, but also a recognition that this killing is because the Vietnamese cannot find a way to peace. So I agree with your implication of “created not by foreigners,” but it’s an unstated implication. If you think it strange, no one speaks of it. This song with originally a Duy Khánh vehicle. He was the first to record it on Sóng Nhạc records (I’d love to hear that recording) and published it under his imprint (both in 1968). Good point on the implication. Yes, I may go a little far with the term “foreigners.” Hoài Linh also doesn’t use nội chiến, so civil warfare is implied rather than spelled out as in TCS. Still, “xa lạ” means “foreign” among other things. It provides an implicit contrast to the First Indochina War in which all Vietnamese were against the French. I did think of translating “anh” as “brother” as you did above, since it probably refers to the Vietnamese communists who began the Tet Offensive. I decided against it because the term is ambiguous in this context. But it isn’t unreasonable to use “brother.” “No one speaks of it” is closer than “we do not speak of it.” Thanks for the note on Duy Khánh, which I didn’t know before.